While we are not likely to see this scenario at modern rodeos these days, it was not uncommon in the 1920s and ’30s for women to compete in the same rodeo arenas and draw from the same rough stock as the men. The first cowgirls learned to ride out of necessity to help on their family ranches. At an early age they learned to ride horses, rope cattle, and stay in the saddle atop an untamed bucking bronc. 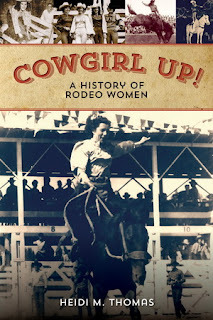 The 1920s are known as the “heyday” of women’s rodeo, producing more world champion female riders than any time since. These cowgirls were products of working-ranch values, where athleticism, skill, competitiveness, and grit were acceptable traits in women. Some cowboys were skeptical of women rodeo riders, and society in general branded them “loose women.” It was claimed that women who participated in such a rough sport would not be able to bear children. These cowgirls were also criticized for the practical, comfortable clothing they adopted—first, divided skirts and then pants. Well-known British-born photographer Evelyn Cameron found out what could happen when she wore a split skirt she’d designed and sewed. Going about her shopping in a rural Montana town, she was accosted by a group of angry townswomen, along with the sheriff, who threated to throw her in jail unless she got out of town immediately. But these cowgirls proved themselves capable of surviving the rough life of rodeo, while still hanging on to their femininity, and they became accomplished athletes well ahead of the athletic and feminist movement of the 1970s. Rodeo cowgirls pursued their dream nationally and internationally until the 1940s. Madison Square Garden Rodeo in 1941 was the last time a woman (Vivian White) was able to compete on rough stock in a sanctioned rodeo. It has only been the past 14 years that a women, Kaila Mussel of BC, Canada, has qualified to compete with men, riding saddle broncs, on the PRCA circuit. Heidi M. Thomas is the author of Cowgirl Up! A History of Rodeo Women, and the “Cowgirl Dreams” novel trilogy, based on her grandmother who was a roughstock rodeo rider in Montana during the 1920s. She is a member of the Professional Writers of Prescott, Women Writing the West, edits, writes and teaches classes in north-central Arizona. Reading this post, I couldn't help but compare the extraordinary cowgirls in the first half of the twentieth century to writers who seek to find the "voice" that sets them apart from all the others who vie for a piece of the reading audience. A writer's voice extends far beyond the way words are put together or a phrase is turned; it encompasses a unique view of the world with all its beauties and its woes. An author's sensibilities come into play through characters and express the writer's uniqueness as a human being. A strong, consistent voice identifies an author through his/her stories. Cowgirls had a strong voice that expressed itself through their rough and tumble participation in the predominantly man's world of rodeo. As Dale Evans noted, cowgirl is a state of mind. These strong women, trained and honed in the hard physical work of ranching, found their place in the rodeo arenas and spoke of their pioneer spirit and determination in their actions. They expressed their values and who they were through their rides. This is a great post, Heidi, and it speaks of so much more than women rodeo riders. It holds up cowgirls as an example of the strength of the human spirit regardless of gender. What powerful grist for the writing mill! Very well done. Great insight, Linda! Thanks for your comments. I am always saddened by examples where women's history has been ignored, disparaged, or deliberately erased. Thanks for giving cowgirls a little spotlight. I've found that ranchers and farmers are often more open-minded about the roles or women. They've worked beside their mothers, sisters, wives and daughters and know women are capable of doing the same rough jobs as they are. Many family agricultural operations couldn't make it without the women in the family carrying the same load as the men. Those early rodeo women must have been very brave to face the public blowback. What a great bit of history, Heidi. Thanks so much for showcasing these strong women. Hey, I impressed by anyone who authors a history, Heidi ... the research involved makes my poor little brain swoon ... yours (books that is) sounds pretty cool. Thank you all for commenting on my post. This has been a fascinating journey for me to delve into the cowgirls' history and learn a little more about my grandmother. I am a compulsive writer. I look forward to reading much, much more, especially histories. What an interesting post and something I knew nothing about. I come from the Rosie the Riveter era, with my mother working in the factories while my father was off fighting the war. Women are tough. And we're getting tougher. Great post.